While out walking on this day, the shortest of the year, I began thinking about how grown-ups might be connecting kids with nature this time of year. To my mind, finding ways to help children make meaningful connections with (nonhuman) nature is one of the most pressing challenges of the 21st Century, rivaling global warming, habitat loss, and species extinctions. After all, how can we possibly live sustainably in a place we don’t care about? And why would we care unless we have meaningful experiences in that place, and know something of how it works and how it came to be? Jade out having fun in Nature! On the one hand, the holiday season would seem to offer great opportunities for making nature connections, since kids have time off school and other activities. On the other, adults are often running around working, shopping, and/or staggering from party to party. Then there are the obstacles of winter, like finding sufficient daylight and warmth. How many kids are going to be passionate about turning off the screens to face the frigid temperatures outdoors? 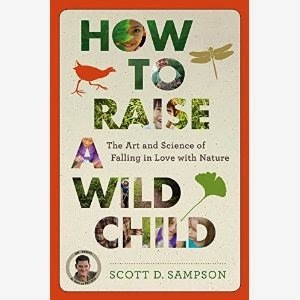 Yet, I know that there are millions of people who will be out there connecting their kids to nature this holiday season. What I—and, my assumption is, many others—want to know is, What are they doing? Before getting to that question, let me return for a minute to technology. Many people in the children-and-nature movement see technology as the enemy—the evil that now enslaves children for 7-10 hours a day in front at screens. But, let’s be frank. Technology isn’t going away; indeed it’s only going to accelerate, at least for the foreseeable future. So, perhaps ironically, I’m convinced that we need to come up with creative ways to use technology to aid the cause of nature connection. And that, my friends, brings me to Twitter. I recently joined the Twitterverse, which, for me, felt like a big move. But I have to say, the decision was a great one, and I haven’t looked back. Not only have I shared ideas with many like-minded (and not so like-minded) people. I have learned about cutting edge news and events that I undoubtedly would have missed if I hadn’t been tossing out the occasional tweet. Jade and friend Tessa camping. WHAT IS YOUR FAVORITE WAY TO CONNECT KIDS TO NATURE DURING THE WINTER HOLIDAY SEASON? It might be something you’ve done before, something you’re doing this year, or something you dream of doing (e.g., surfing off the coast of Maui on Christmas day). Stargazing, beach walking, snowball fights, snowboarding, a visit to the local natural history museum—it’s all fair game. Tweet your answer to #HolidayNature by Wednesday, January 4th, 2012, so that others can find out what you’re up to. Please include @DrScottSampson in your tweet so that I can track all the submissions. I will tally and blog about the results, choosing what I think are the Top 10 best answers. And if, as anticipated, the material warrants, I’ll write up an article and submit it for publication so that many other folks can benefit from your collective creativity and wisdom! As for me, well, let me throw my hat into the ring too. Jade, my 9-year-old daughter pictured in the accompanying photos, is passionate about birds (you know, living dinosaurs), so we'll be heading into the local hills, or perhaps down to the lagoon, to do some birding. So, what are you doing to connect your kids to nature this holiday season? Let the masses know! And please follow me on Twitter (@DrScottSampson). I promise many future tweets on nature connection! Dinosaur Train Gets Into Nature! At the time I had no idea if a television program could induce kids to turn off the TV and head outdoors. However, based on the hundreds of comments I’ve received from parents, I’m now convinced. I regularly hear about boys like Tommy who are always heading outdoors to dig for fossils (makes me wonder about the holes in the backyard . . .), and girls like Mary who have become avid birdwatchers (that is, dinosaur observers!). A nationwide Dinosaur Train geocaching program was added, which has also been very successful at getting kids to explore their local areas. 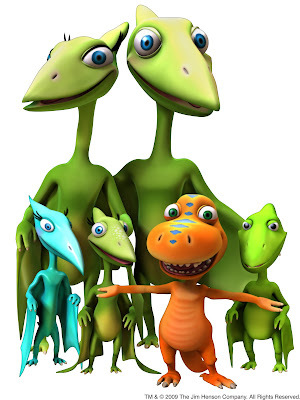 By the time we began production on Season 2 of Dinosaur Train, the Henson Company and PBS KIDS were equally excited about the idea of getting kids outside. 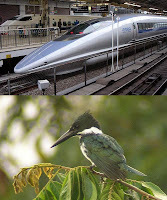 Indeed it was decided that nature connection would become one of the show’s primary themes. As a result, the animated kid characters, led by Buddy the T. rex and Tiny Pteranodon, have formed their own nature club (the “Nature Trackers”) and now spend much of their time making natural history collections and firsthand observations about their surroundings. Some kids at the beach being filmed making nature art. Along with cool new dinosaurs, featured topics for connecting kids to nature now include plants, insects, stars, rocks, and nature art. In the interstitial portion of each episode, which I have the pleasure of hosting, we’re encouraging kids more than ever to explore local nature. In Season 1, all of the interstitials were shot on green screen in a Hollywood studio—hardly the ideal setting for encouraging nature exploration. But for Season 2, we’re featuring shoot locations out in nature (e.g., redwood forests, beautiful beaches, and tidepools burgeoning with animals), as well as in museums, often showing real children connecting to real nature! Check out some of the new episodes and songs here, including a very cute tune called “Get Into Nature.” The award-winning website will soon be bolstered with all kinds of activities to help parents connect their kids to the natural world. Dinosaur Train has even partnered with the Cornell Lab of Ornithology to help foster an entire generation of kid birdwatchers! Currently, the show is viewed in more than 9 million households a month, and appears to be gaining steam! So stay tuned and get onboard! The Dinosaur Train Film Crew! Below is the third and final part of the human evolution story. Parts 1 and 2 can be found in the previous two posts. Touching down once more in the time machine, we find ourselves surrounded by now familiar grassland expanses. The monotonous scene is punctuated only by a mud-lined waterhole, which at the moment is hosting a herd of Elephas recki, the same giant proboscideans from the second act. Standing in the shallows close by, seemingly oblivious to the elephants’ antics, a six-foot tall marabou stork fishes for whatever critters might reveal themselves. African waterholes in late afternoon attract a wide range of thirsty animals, and their predators. After a few hours spent watching the faunal procession, you guess correctly that all of the usual suspects are present—pigs, antelope, zebra, hyena, and the like. Mesmerized by the setting sun and the building hum of insects, you’re surprised to see five hominins approaching, three individuals moving together in front and two trailing behind. As they get closer it becomes clear that these upright primates, all males, are wholly different than any seen previously. Compared to hobbit-like Ardi and Nutcracker Woman, these individuals are giants, approaching six feet in height. Much of this length is devoted to long, muscle-bound, striding legs. Gone are the elongate, gorilla-like arms, replaced by upper limbs proportioned like our own. Also absent is the profusion of body hair, exposing the naked skin beneath. Indeed, in the waning light of dusk, these figures look so familiar that for a moment you wonder if the time machine has returned you to the present day. But above the shoulders, that sense of familiarity diminishes. The skull dome looks bigger than that of an australopith, yet notably smaller than our own. A prominent nose protrudes from beneath thickened brow ridges. Among the trio in the lead, two are shouldering bulky antelope shanks still encased in mottled brown skin, while another totes some unidentifiable hunk of meat. Bringing up the rear are two younger males carrying stone tools. You elect to follow the group, who, after another a half-mile trek, join up with several females and children. The female adults, only slightly smaller than the males, are busy working with fist-sized stone tools to release nutrients from large tubers, while the four youngsters run about playing. Welcome to Act III, the most recent of the human journey, extending from roughly 2 million years ago to the present day. We’ve arrived in the midst of the Pleistocene Epoch, about 1.5 million years ago, another landmark moment in our story. Increasing aridity has decimated the forests and driven the proliferation of grasslands. Several mammal lineages, herbivore and carnivore alike, have been traveling northward with the expanding grasslands, and some have recently broken the bonds of the African continent to venture into Asia and Europe. Accompanying these emigrants is a two-legged omnivore, Homo erectus, the very hominin you’ve been watching. 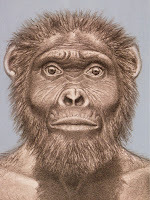 Whereas Act I hominins like Ardipithecus were devoted forest-dwellers, spending most of their time in trees; and Act II protagonists like Paranthropus and Australopithecus split their time between the trees and the ground; in the skeleton of erectus we see the first evidence of a permanent pact with terra firma. Tree-climbing adaptations were replaced by long, lean legs well suited for endurance walking. Brain sizes averaged close to 1000 cc, only about 25 percent less than our own. Regional populations, each with unique traits, developed in Europe and Asia, where they encountered new varieties of large mammals, from mammoth to cave bear. It is unclear whether erectus had made the transition from scavenger to predator by the time of its initial exodus from Africa. But it appears virtually certain that this close cousin of our’s was an effective big game hunter throughout most of its lengthy tenure. The hunting and gathering lifestyle that would eventually characterize the bulk of human history got its start in Homo erectus. The Old World had received its first taste of a carnivorous ape. One of the perils of walking long distances over hot, arid terrain is water loss. This hazard is exacerbated by a cooling system that depends on sweat glands distributed over much of the body. Like chimps and gorillas, earlier hominins possessed a flat nose marked by a pair of forward-facing openings in the middle of the face. With erectus the bony margins of the nose openings became raised and conjoined, forming a distinctive, sloping bridge. Inside, expanded nasal cavities housed complex swirls of bone lined with spongy mucous. The newly remodeled nose offered a finely tuned water retention device, capturing moisture from the hot, humid air exhaled from the lungs. For similar reasons, although we can’t be certain, Homo erectus may have been the first hairless hominin. Body hair tends to hold onto heat, so erectus’ commitment to life on the hot savannah may well have triggered the loss of a “furry” covering. If so, we can thank Homo erectus for both our prominent noses and our nakedness. The so-called “Acheulean” tradition of Homo erectus was dominated by a single stone implement—the hand ax. The Acheulean hand ax is the epitome of functionality, crafted by using some sort of “hammer”—often made of bone, antler, or wood—to remove flakes of rock from a “core.” Whereas Oldowan toolmakers were apparently most interested in the flakes, it’s the core that became the chief implement of erectus. By removing flakes symmetrically from both sides, the fist-sized hand ax offered a highly versatile tool that likely served for slicing, scraping, crushing, digging, and other uses. (Can’t you just imagine the late night television advertisement? “Brought to you by Erectus Industries Inc., the amazing tool that slices, dices, and juliennes!”) Homo erectus was the longest-lived hominin, thriving for over a million years. Although we see some evidence of a progressive improvement in tool technologies, the hand ax persisted throughout that impossibly lengthy duration. Confronted by the bewildering pace of technological change seen today—with computers outdated almost as soon as they reach the market—it’s inconceivable to imagine a particular tool being used for a century, let alone ten thousand centuries! What does this staggering monotony tell us of the mind of Homo erectus? On that matter there is much disagreement, but one thing’s for sure. We can safely assume that innovation was not a priority. How are we to explain this suite of bodily and behavioral features, which pushed the hominin lineage, as one anthropologist put it, over to the human side of the “great divide?” Best we can tell, the eco-evolutionary chain of events went something like this. By 2 million years ago, the human line was devoted to a diet of high-quality, widely dispersed, and difficult-to-obtain foodstuffs, both plants and meat. The major bump in body size seen in erectus is plausibly linked to the dangers of carnivory. With pathetic footspeed and fewer trees to retreat into, hominins had no choice but to face down competing carnivores, among them lions, leopards, and sabertooths. Six-foot tall hominins would have had a great intimidation advantage over their four-foot forebears. With larger bodies came greater caloric needs, which in turn translated into more extensive home ranges (necessary to locate sufficient amounts of food). Longer legs would have been beneficial to travel the increased distances, and a larger brain would have come in handy to store mental maps of the surrounding terrain. Increased brainpower may also have been necessary to mimic Acheulean stone tool-making techniques. The trend toward bushiness of the hominin family tree continued in Act III. 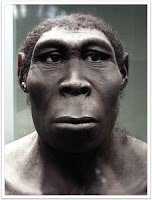 In earlier scenes, Homo erectus shared the African continent with several Act II die-hards; Australopithecus sediba persevered until about 1.75 million years ago, Homo habilis until 1.4 million years ago, and Paranthropus boisei until shortly before 1 million years ago. Later in the record-breaking reign of Homo erectus, several additional species of Homo appeared, perhaps evolutionary offspring of the king himself. Examples included antecessor (Europe), heidelbergensis (Europe, Africa, and China), and neanderthalensis (Neanderthals, Europe). Following the extinction of Homo erectus, several Homo species persisted . Among the most successful were the Neanderthals, cold weather specialists that thrived in Ice Age Europe and Asia between about 200,000 and 28,000 years ago. Key adaptations of this clan, possibly our closest hominin cousins, included a brawny build and stocky stature (better for retaining heat), with males averaging about 5’ 5”. Dominating the Neanderthal face was a huge nose used for warming and humidifying cold, dry air. Other features included a long mid-face region, low forehead, and an elongate cranial vault housing a brain as large or larger than our own. 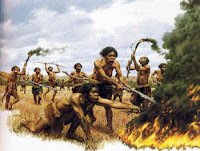 Neanderthals controlled fire, lived in shelters, hunted big game, and buried their dead. They made and wore clothing and developed a sophisticated tool kit. The highly successful Neanderthals may have displaced groups of Homo sapiens in certain regions when the climate turned extra frigid. The fate of Neanderthals remains a mystery, but recent genetic studies suggest that they interbred with humans, and that we still carry some of their genes. Among several recently discovered hominins that lived late in Act III are a phantom and a hobbit. The phantom, informally dubbed the “Denisova hominin,” is known from a single fragmentary finger bone and an isolated tooth dating to 41,000 years old . Recovered from Denisova Cave in Siberia, Russia, the single bone has yielded mitochondrial DNA suggesting that the finger’s owner belonged to a distinct species sharing a common ancestor with Neanderthals. Meanwhile, Homo floresiensis was a three and a half foot tall hominin that inhabited the Indonesian Island of Flores between 95,000 and 17,000 years ago . Nicknamed “Hobbit,” this pint-sized, large-footed, small-brained, chinless wonder used stone tools to hunt pygmy elephants and giant Komodo dragons! Controversy still ensues about the closest relatives (and even the veracity) of this surprising member of our family tree, but the growing consensus is that Hobbit is descended from an ancient member of our Homo tribe who departed Africa about 2 million years ago. Finally we come to our own species, Homo sapiens, a name that translates as “wise man.” Although various species of Homo had already spread over much of Asia and Europe, the first sapiens were birthed back in the womb of Africa some 200,000 years ago, perhaps evolving from erectus populations that had stayed behind. Compared to our first cousins, the Neanderthals, we possess a more lightly built skeleton, weaker jaws with smaller teeth, a flatter face, a thinner brow, a vertical forehand, and a vaulted cranium. Like erectus, neanderthalensis, and most other members of the Homo clan, the earliest sapiens gathered food and hunted animals. Indeed our ancestors were apparently ardent carnivores who took big game hunting to a new, more lethal level. Around 60,000 years ago, Homo sapiens underwent what some refer to as the “Great Leap Forward.” The pace of cultural change suddenly accelerated. Bone artifacts such as fish hooks and needles appeared. Stone tools took on a strongly regional flavor, in some cases including sophisticated weaponry. Cave paintings, body ornaments, and sculptures appear, hinting at a fundamental shift of mind, and we see the first evidence of long-distance trade. Genetic evidence indicates that much of this revolution can be traced to a small group of sapiens that migrated out of Africa, mimicking the wave of erectus populations hundreds of thousands of years prior . This time, however, the wave swelled to a tsunami that did not stop in Asia or Europe. The first tsunami wave of modern humans crossed the Red Sea into the Near East and then on to East Asia and Australia. The second moved northward into Europe, Asia and eventually the Americas. Along the way, these populations encountered and displaced other varieties of Homo, including Neanderthals, until we were the only surviving hominin species. Homo sapiens, a late-arriving, globe-trotting bipedal ape, had somehow developed the capacity to live pretty much anywhere, from sweltering deserts to the frigid Arctic. (Among mammals, only the Norwegian rat [Rattus norvegicus] even approaches the geographic distribution of humans, occurring on every continent except Antarctica.) Beginning about 10,000 years ago, we began to give up our itinerant ways and settle down, likely in response to a shift toward more stable climates. The ability to stay put came largely from cultivating plants and animals. Over a relatively brief period, agriculture arose independently five times. With heightened food yields came much larger populations and, very quickly, civilizations. Civilizations have continued to expand ever since, swallowing all but a handful of foraging cultures and, in the last eyeblink of time, wreaking havoc with the Earth’s biosphere. returning to the question that kicked off this discussion, why did humans, as opposed to chimpanzees, elephants, orcas, or some other creature, become such a dominant presence on Earth? The answer, it seems, invokes a unique concatenation of events within our lineage. Humanity’s runaway success required several essential elements—in particular, the physical, mental, and social capacity to develop advanced technologies. 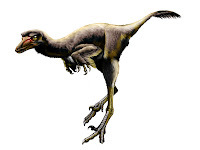 In Act 1, the most critical evolutionary acquisition was bipedalism. Walking upright freed the hands for other activities, including transport. It also enabled early hominins to expand their geographical ranges and encounter environments well beyond the experience of other apes. In Act II, manual dexterity was added to the repertoire, a capacity that transformed stones into tooth-mimicking tools. The making and transporting of stone tools opened up an entirely new niche—carnivory—sending our ancestors off down yet another evolutionary rabbit hole. Finally, in Act III (and the tail end of Act II), our newly acquired penchant for meat and nutrient-rich marrow sparked the evolution of larger, more sophisticated brains. Out on the open savannah, our ancestors quickly evolved traits that could help them tap into the large, scattered packages of plants and meat available there. The evolutionary results included new tool technologies, heightened imitative abilities, and a strong bias toward within-group cooperation. But beware the fallacy of hindsight. Reflecting on the human journey, we must fight a powerful, largely unconscious bias to view early hominins as a succession of warm-up acts—“experiments in being human,” to use the preferred scientific phraseology—leading to our inevitable main event. Evolution has no foresight. 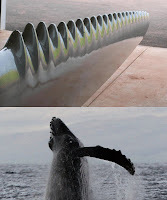 It reacts only to present circumstances, fitting organisms to the habitats they live in. 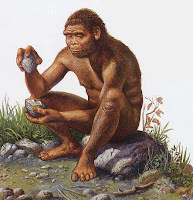 In hitting one rock against another to generate sharp-edged blades, Australopithecus garhi (or some near cousin) gained access to a new suite of foodstuffs, thereby enhancing its odds of survival. These little hairy hominins had no clue that stone tools might trigger a cascade of events that would ultimately send their distant descendants to the moon. They were concerned only with immediate circumstances, just as we are most of the time. In short, chimps don’t run the world today because the ecological circumstances encountered by their ancestors didn’t produce the necessary evolutionary steps (for example, bipedalism, manual dexterity, and bigger brains). Similarly, elephants and whales didn’t evolve key elements, such as the physical capacity to create a material culture. Is that it then? Are we merely an evolutionary fluke, the result of a staggeringly improbable series of events? Or is there a larger arc to this narrative? What greater meaning, if any, are we to derive from the human journey? Answering these questions must be the topic of a future post. 9. A key lesson emerging from the human journey is that our present day circumstance, with a single hominin species, is the exceedingly rare exception. Throughout most of the past several million years, multiple hominin species have co-occurred, with two or three frequently sharing the same habitat. Those who continue to make the claim that no evidence exists of fossil intermediates in the human family tree are either not paying attention, or (as is too often the case) purposefully twisting the data to match preconceived biases against evolution. 12. Brown P., Sutikna T., Morwood M., Soejono R. P., Jatmiko, Saptomo E.W. et al. 2004. A new small-bodied hominin from the late Pleistocene of Flores, Indonesia. Nature, 431:1055-61; Morwood M. et al. (2005): Further evidence for small-bodied hominins from the Late Pleistocene of Flores, Indonesia. Nature, 437:1012-1017. 13. Stringer, C. and McKie, R. 1998. African Exodus: The Origins of Modern Humanity. Holt, New York; Tattersall, I. 2009. 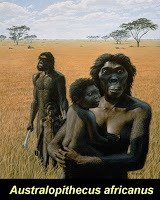 Human origins: Out of Africa. Proc. Natl. Acad. Sci. USA, 106(38):16018-16021.